Custom lollipops aren’t just for kids. No, these tasty little gems are perfect for companies that want to enhance the shopping experience for customers. Nothing invites people to take their time perusing a place like having the sweet surprise of a sucker to enjoy. It’s unexpected in a retail setting, and it’s something people pay attention to. Shoppers now have a sweet treat as they contentedly check out your offerings. Our client, VeraMeat, a jewelry company that began in the East Village and has since expanded to Brooklyn and Los Angeles, offers lollipops in custom-printed wrappers to anyone who stops in to browse its handmade pieces. The suckers are deliciously on-brand, featuring a graphic designed for the company by illustrator Anja Slibar. Displayed in cool bowls (hand-picked by the designer Vera herself) that look like gold hunks of coral reef, the red custom lollipops immediately stand out. “We decided to use these lollipops because we were able to customize the graphics, and they come in our store color: red,” says Lauren Wong, Art Director for VeraMeat. So far, shoppers are eating up the promos. With any promotional product, you want the item to get picked up. You want your logo to get seen. Custom lollipops have all the charm and appeal to draw people over. They’re nostalgic in a way, reminding people of their childhood. You might expect to find a jar of lollipops at the bank or doctor’s office, but when they’re placed in an indie jewelry store in the East Village, they give a certain edge to the place. They’re unexpected amid the eccentric and unusual pieces. Bright red lollipops next to necklaces with vampire teeth and daggers definitely catch you off guard – but it works. VeraMeat wanted to give customers a little something sweet while they shopped, and people love the idea. There are lots of ways your company can use promotional lollipops – tradeshow giveaways, mailers, party favors – but there’s something special about placing a bowl or dish of lollipops in a retail setting. 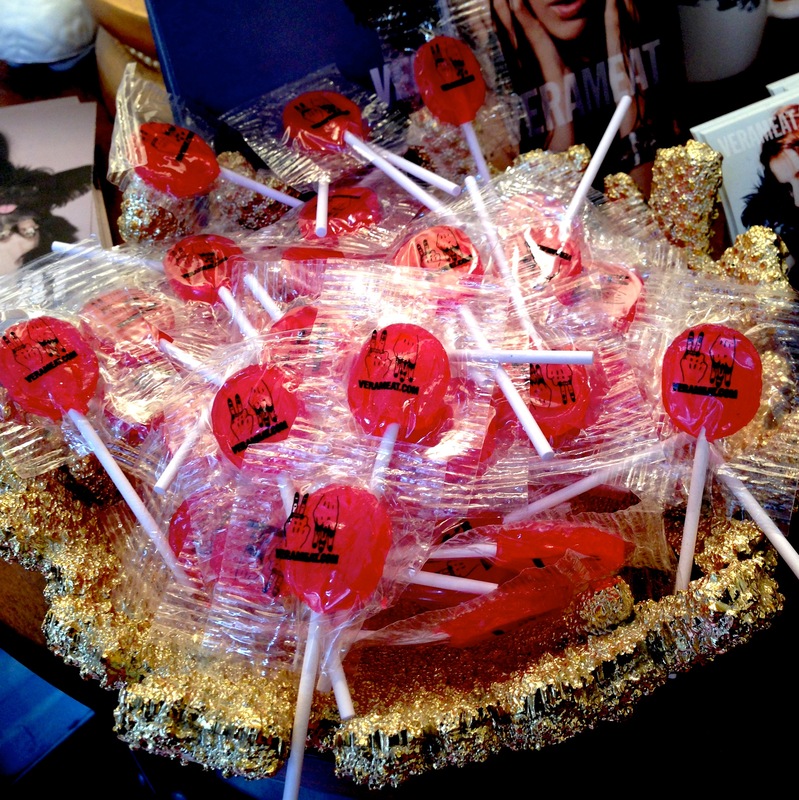 Lollipops are an edible version of rolling out the red carpet for customers. It’s like you’re saying: “Come on in and stay awhile!” They make your customers feel welcome, and they entice them to linger a bit longer. A sweet taste in your customers’ mouths creates an even sweeter taste for your bottom line.